Wow. 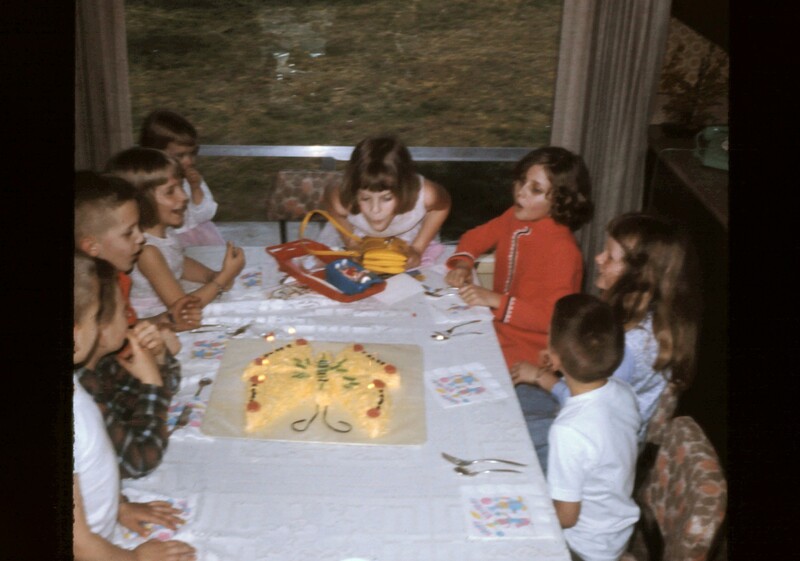 Growing up in my house, birthdays were a big deal. This phenomenon evidently originated from Mom’s side of the family, something Dad had to get used to early in their relationship. Living next door to my maternal grandparents and maternal aunt and family meant there was always a crowd. Many relatives situated close by equaled instant party. 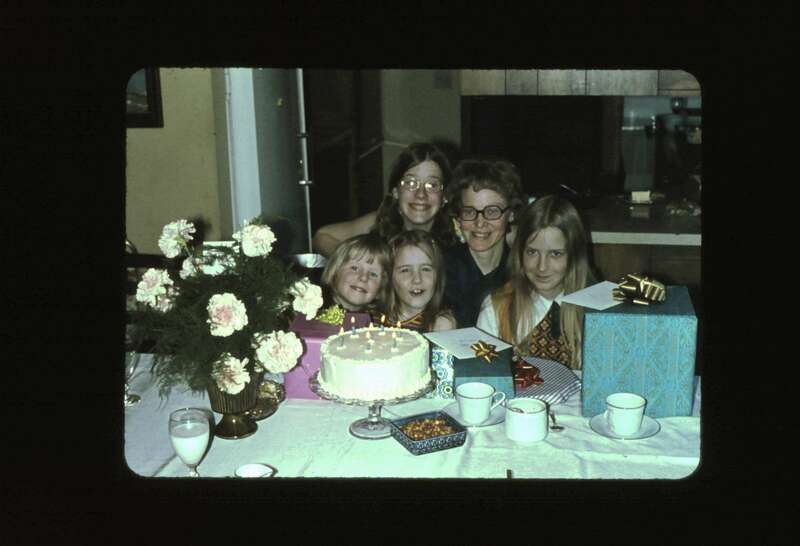 Our growth and development from littles to biggers to grown-ups can all be documented through these photos gathered around tables adorned with cake, presents, and scattered pieces of dish ware and cutlery. 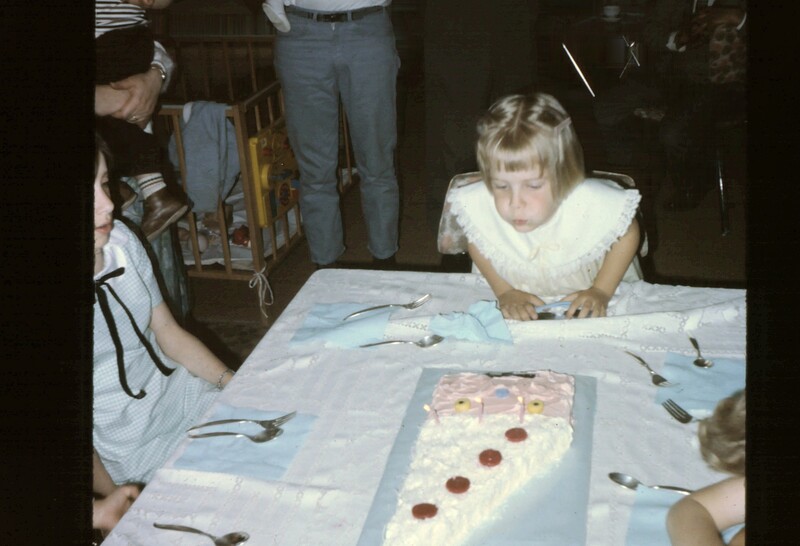 Sometimes Mom was creative with cake shapes, other times it was a simple 2-layer round or 12×18 rectangle, but always removed from the pan and frosted completely. No in-pan celebratory cake for us! 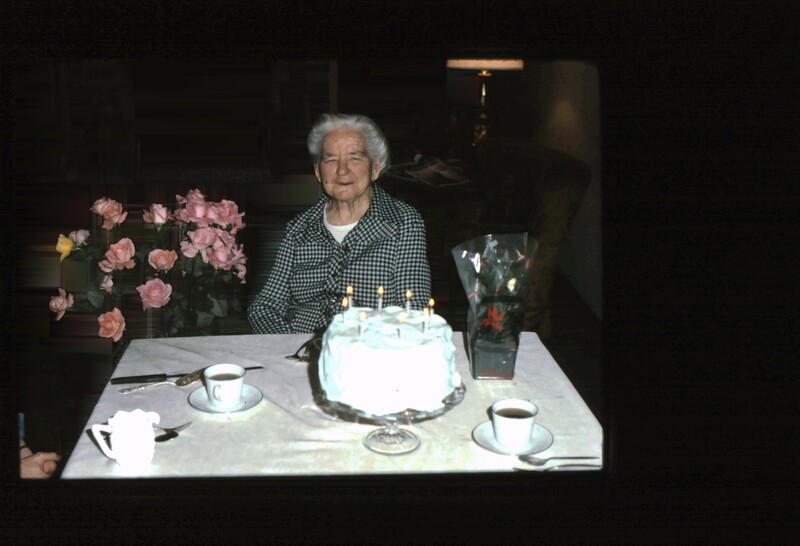 There were always group photos taken of people clustered around the birthday person, and occasionally, a photo of honor for those Emeritus in our midst. My parents both came from Large families. As they grew up, married, had children, their lives continued to revolve around their birth families. These people were their friends, their confidants, their travel companions, even their nemeses. It made perfect sense to my parents that we would celebrate everything with my aunts, uncles, and cousins: all of our birthdays, young and old, along with Christmas, New Years, Thanksgiving, graduations, anniversaries. You wouldn’t be able to differentiate between parties, save for the special decor of Christmas, or you were able to read the writing on the cake. As we got older, started developing our own lives, generating our own friendships, relationships, interests, the way we did birthdays needed to change. Having the same gathering, adding in our own friends, with the same aunts & uncles, cousins dutifully showing up, but now bringing significant others, mostly people we really only associated with at these yearly events, had become awkward, unpleasant, strained. Making things worse, we started to celebrate Group Birthdays: all the May birthdays in the extended family on this day at this place at this time. Generic cake, generic conversation, generic attention. Rather than a fun party to celebrate this great person I know and love, birthday events became a heavy sigh on the calendar. These dysfunctional “celebrations” continued after grandchildren began to appear. Rather than draw boundaries around each individual family, all presumed that a party would be thrown, and everyone and anyone would be invited, leaving the invitees to feel their own sense of duty to attend, or face the subsequent guilt of disappointing The Others. Sadly, these parties weren’t fun. Most pointedly, the birthday person, especially if a child, was given a song by all before candles went out, but after that, every time, at every party, about half of those in attendance had nothing to do with, gave no attention to the person being feted. They would carry on the same conversations they had at the last get together, giving a perfunctory Happy Birthday Hug when leaving. Why were they there? Why did they attend? Why was I there? Answering these questions spawned change. Today we do birthdays however the heck we want to. Sometimes there will be a group gathering with my extended family, not the extended family of my parents. Sometimes we have mini-gatherings with my one sister’s family, then just with Spouse’s folks, then with my other sister plus my parents. Sometimes for Junior, we’ve been able to integrate my nephews with Junior’s other friends for a party, and sometimes, given the emotional makeup of all involved, that hasn’t been ideal. Often my nieces, now adults, make dates with us or their grandparents or my sister to do something to celebrate their special day or days. We instigated Birthday Weeks, taking all the undue and ridiculous pressure from this One Day of the Year, Our Big Day, etc. We want to celebrate the person. We play games. We try to involve the youngers with activities, rather than have them fend for themselves, yet again, while the adults, deep in chit-chat, ignore them. Birthdays have become fun again. One nice tradition that my parents have faithfully continued is the telephoned birthday song. This morning, when my phone rang at 8:55AM, I had a strong suspicion of what might be in store. I was right! After my “Hello”, there was a slight pause, an intake of breath, and another careful, theatrical, quasi-operatic rendition of Happy Birthday. The two people who decided that trying again for that son they really wanted was a good idea; the two people who really thrilled when I turned out to be me rather than some unknown named Bradley; the two people who have loved me from Day One, sang me their best rendition yet. Happy birthday, Lisa! This entry was posted in General, Holiday and tagged birthday, cake, cousins, dysfunction, friends, grandparents, holidays, nieces, sisters. Bookmark the permalink. OK you. I am going to have to quit reading these at work. I sit here all misty eyed trying to deeply breathe so as to keep the mist from developing into tears running down my cheeks. This is again so beautiful. I love you and your story and your manner of revealing your story to the rest of us. Thank you for your careful honoring of the truth of this part of your story. You are a treasure. I believe I have instigated the after 50 call for a celebratory day each week for the whole damn year. For crying out loud, life is worth celebrating, in beautiful truthful, meaningful. and fun ways. Cheers to you sister. I got teary eyed and a big smile as I saw this picture of Grandma. What an amazing woman w/ hugs that would engulf little me. In reading this blog I felt like I could have written it myself. These memories become fonder w/ the passing years. 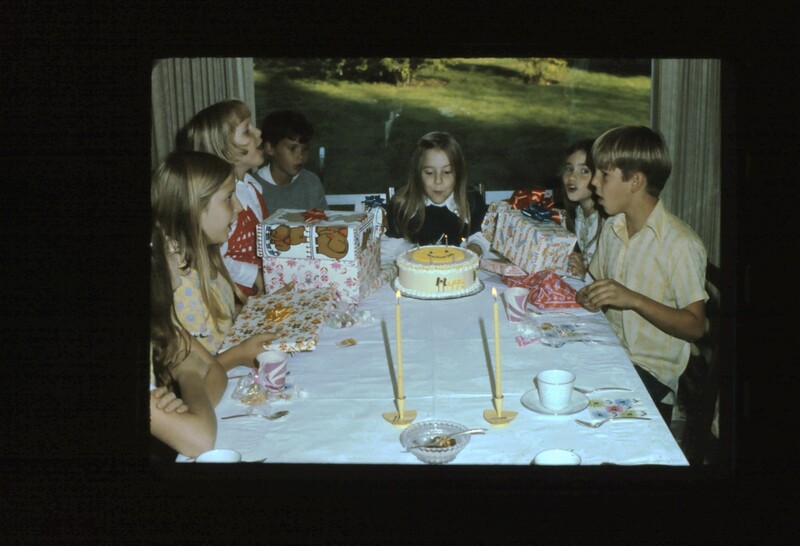 I often think of these parties that seemed to consume our days – remembering the carefully made cake yet never remembered that they were “always” free standing out of the pan. Thanks for that reminder. We have all changed a lot since those long ago celebrations and obligations, I am thankful for what they taught me. Keep writing Lisa – I love to be taken back. I love remembering those same hugs! Thanks for reading xo.